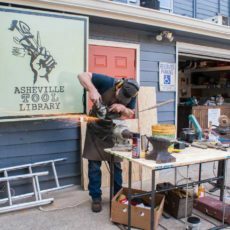 The Asheville Tool Library offers all sorts of tools for you to check out. Sure, hammers and squares and shovels are tools but we recognize that a tool is just about anything you need to get the job done. And that there’s no reason to buy a tool you only need on occasion. Throwing an event is hard work, too, and we have just the sound system to help make it happen. This Fender Mixer is part of our Sound System available for Asheville Tool Library members to borrow. Ready for a party? This set includes: 2 speakers, 2 speaker stands, Fender powered mixer, 2 cords for speakers, one cord for hooking up auxiliary music player. Please don’t turn louder when it doesn’t sound good! Could blow out speaker. It now also includes shure sm58 microphone in pouch, clip, cable and straight stand.